unlike any other as it is from plant source algae, not from rocks such as tradiational calciums. We have many customers who love this calcium and Alive Health Centre, Morning Sun and Supplements Plus would like to share it with you! The TargetCal complex is completed by Vitamin D3 — which is important for calcium absorption and has been found to aid in bone support and function. 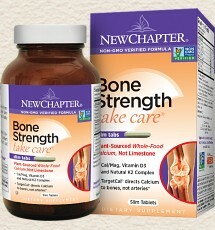 * New Chapter creates whole-food complexed Vitamin D3 by culturing the nutrient with probiotics and organic whole foods.